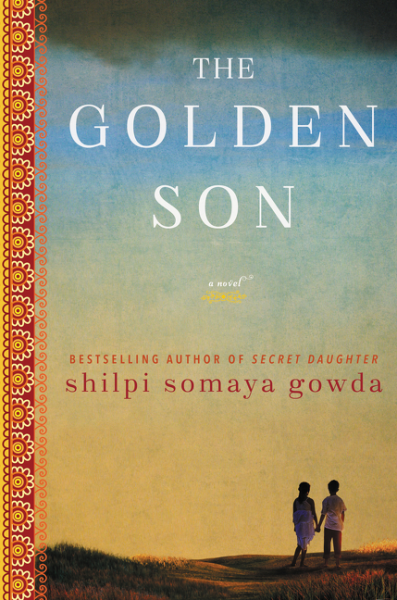 As I work my way through the 50 Book Pledge, one of my latest reads has been The Golden Son, by Shilpi Somaya Gowda. I read Secret Daughter when it came out and really loved Gowda's writing, and I was very excited to have the opportunity to review her new book. The Golden Son tells the story of Anil Patel. He is the first in his family to go to college, and medical school in the US at that, while at the same time balancing many responsibilities back home in India. Despite living in Dallas, Texas for his residency, Anil must still take on the large task of village arbitrator for his small hometown after his father passes away. This is the story of Anil, as he struggles between two worlds, trying to decide in which really he belongs. At the same time, Anil's childhood friend, Leena, becomes trapped in an arranged marriage, causing her to make a drastic decision that brings much shame to her family. Eventually, Anil and Leena cross paths again. They sort through the choices and events that led them to where they are and work towards figuring out what happens next, so they can each find their own true selves. Just as I loved Gowda's writing in Secret Daughter, The Golden Son does not disappoint. I actually enjoyed the story even more. I've been watching a lot of Grey's Anatomy lately, so I was very interested in Anil's experiences during his residency at the Dallas hospital, and I love storylines that weave together over time. This book flowed smoothly and had a few twists that I hadn't predicted. The characters are very richly developed, and I felt connected with many of them. I yearned for these families to find peace and happiness. This is a story of push and pull. Between cultures. Between duty and choice. Between the past and the future. Between families. And even within the characters themselves. I absolutely recommend this book, and am confident any reader would really enjoy this compelling novel. Disclaimer - I received a copy of this book for review from TLC Book Tours. All thoughts and opinions are entirely my own.